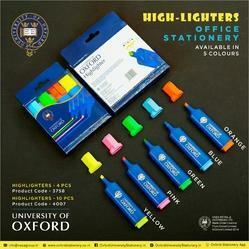 We offer highlighters and markers which are available in vibrant fluorescent colours. Refillable inks, are non-toxic and do not smear or bleed on paper. These are ideal for plain paper, photocopies and fax sheets. 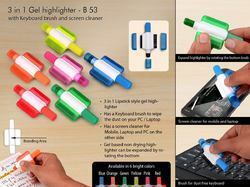 High quality jumbo highlighter in fluorescent yellow, pink & orange. When you need to highlight your point clearly, take no chance. ADD highlighter is the obvious choice. We are engaging of Importing and sourcing of verious kind of Highlighter from best factories with better quality. When important words need to be in focus, non-bleeding Highlighters ensure that specific words get highlighted and none around it.The fluorescent colors of our Highlighters are ideal for paper, copy or fax. They are long lasting and maintain the ASTM D-4236 standards, so you can go on highlighting as much as you want.